Because the ETV 1000 Caponord means no limits power, comfort and reliability on any terrain and over any distance. The versatility and carrying capacity of a maxi enduro to accompany you on every trip with absolute freedom and independence. But also sporty performance, a fun but safe ride and an elegant comfortable design. 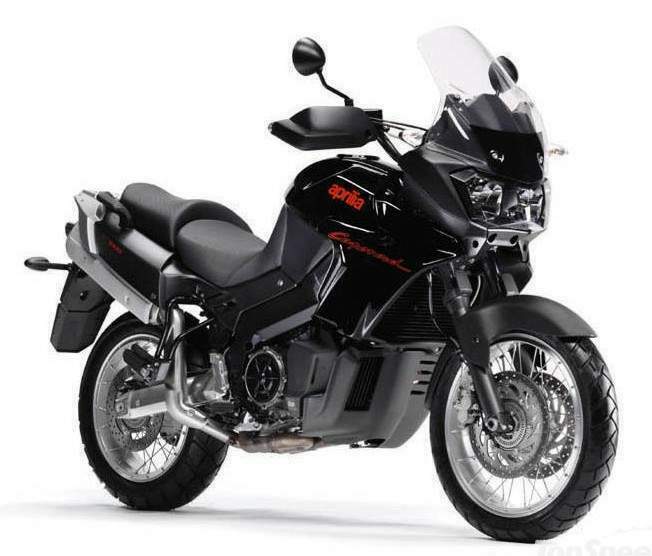 The ETV 1000 Caponord at last you can experience all the emotions, fascination and potential of total touring. Slim and streamlined, refined and functional, created to express the best possible interaction between machine, rider and passenger, wind tunnel tested to eliminate even the most minimal turbulence - the design of the ETV 1000 Caponord captivates and convinces right from the first glance, as happens only with something born to last and destined to go a very, very long way. Its enveloping lines guarantee an ultra-high coefficient of aerodynamic penetration, even when riding in an upright position, while the large front fairing, built-in hand guards and tank design protect the body from the wind for absolute comfort at all speeds. Smooth, flexible, ever ready to deliver its full power (98 hp to the shaft) even at low revs and to give you the all the delight of a sporty but at the same time easy and safe ride. The ETV 1000 Caponord 60° V twin engine has been specifically designed for this original, multi-purpose and unique bike. It is light and compact to fit in perfectly with the mechanics, guaranteeing optimum handling and stability. The specific design of the pistons, camshafts and throttle bodies, special intake and exhaust system and sophisticated electronic injection guarantee the highest possible torque at low revs. The ETV 1000 Caponord engine also features two famous and exclusive Aprilia patents: the AVDC Anti Vibration Double Countershaft system for even more total riding comfort, even on long fast trips and the PPC Pneumatic Power Clutch to make the clutch lever lighter to operate and avoid rear wheel bounce during sudden deceleration for even better stability and handling. The ETV 1000 Caponord is the first trail bike with variable geometry aluminium alloy double beam perimeter frame (Double Wave Aluminium Beam). Two characteristics which guarantee the highest torsional rigidity in its class. But that’s not all. The swingarm is also in aluminium and magnesium alloy. The central section is cold-cast and the arms and terminals forged to guarantee the best possible relationship between lightness and rigidity. The front suspension with 50 mm diameter sleeves is the same as used in racing enduros, but the calibration has been optimised to guarantee maximum comfort both on roads and motorways and on tracks and trails. The rear suspension is multi-adjustable with a convenient external knob to adapt the trim of the bike not just to all types of terrain, but also to all carrying conditions, whether alone or with a passenger, with or without bags. The ETV 1000 Caponord is fitted as standard with innovative and exclusive Tubeless Spoke Rims, enabling tubeless tyres to be used, yet one more advantage in terms of safety. In addition, the particular spoke arrangement together with the exclusive hollow hubs and large diameter wheel spindles provide a high level of torsional rigidity and thus stability during cornering, even at high speeds. Free your desire to go wherever you want with whoever you want. The ETV 1000 Caponord is the first choice for all those who want to travel and experience the most diverse of situations, for all those who never let themselves be swayed by fashion, following nothing but their own curiosity and vitality, their own desire for new landscapes, encounters and emotions. In all situations, the ETV 1000 Caponord gives of its best, not just in terms of performance, but also of functionality and versatility. Its carrying capacity knows no limits, partly thanks to the possibility of removing the rear saddle to create a further, roomy compartment for luggage and to regulate both headlights independently depending on the weight and load distribution. The tank capacity is also optimum for touring use - 25 Litres, including a five litre reserve. So you can get wherever you want in complete freedom and autonomy, together with the person you love and the bike you love, the ETV 1000 Caponord. 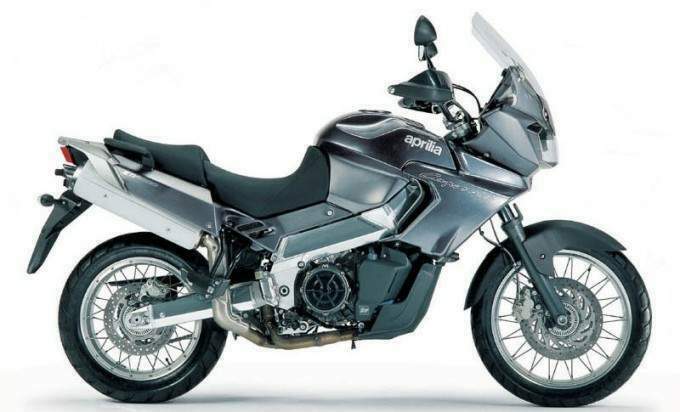 Panniers, top box, tank bag - with Aprilia original accessories, your ETV 1000 Caponord is ready to take on any journey, while retaining perfect aerodynamics and weight distribution, together with an unmistakable look. And with Aprilia helmets, technical garments and sportswear, you can experience practicality, freedom of movement, comfort and, of course, style, in body and soul.